Hello! Thanks for joining us for Episode #21 of the Where Else to Go Podcast. 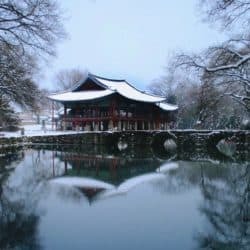 Today we’ll be talking with Samantha about Namwon, South Korea. Samantha is a travel blogger and is currently teaching ESL in Namwon. She fell in love with the area and wants us to as well. Namwon is about a two hour KTX train ride from Seoul, or a three to four-hour bus ride, depending on traffic. It’s an hour from Jeonju, which is rising on the Korean travel lists for its traditional housing (Hanoks). 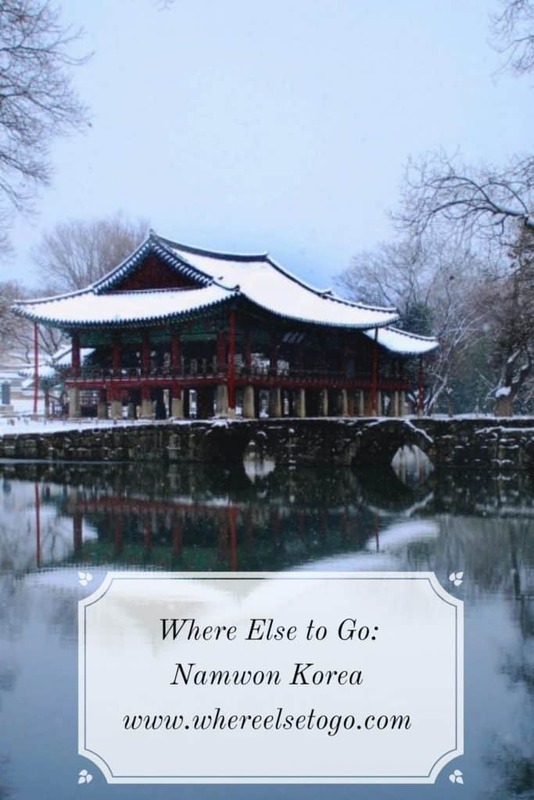 Samantha says that Namwon is a lovely walkable city, but that too many people don’t know it exists. For anyone interested in traditional Korean culture, Namwon is the setting for one of Korea’s most famous love stories, Chunhyangjeon. (Think of it as Korea’s Romeo and Juliet minus the tragic ending.) There’s a beautiful park you can wander around called Gwanghallu that has the story laid out, and you can also go to an amusement park based around Chunhyang. If you’re interested in nature, Namwon is also one of the cities based around Jiri Mountain (Jirisan), one of Korea’s three most important mountains along with Hallasan and Seoraksan. There are a bunch of trails of varying degrees of difficulty, and one notable short one that gives you a beautiful view of the city. If you come in autumn, you’ll get rows of fall foliage, and if you come in early spring, you might just catch all the cherry blossoms lining the main river. If you like food, Namwon is also located in Jeollabuk province. The Jeolla provinces are considered the food provinces of Korea, so if you want good Korean food, it’s here. Take the KTX Train (about two hours) from the Yongsan Station in Seoul to the Namwon Station. Be sure to look for the KTX train as other will take you about twice the time. To take the bus to Namwon, head to the Express Bus Terminal on the Seoul subway. They have self-serve kiosks that include English. The bus takes three to four hours, depending on traffic, and takes a 15-minute rest stop break about halfway through the journey. There are two types of buses, one that has two seats on each side of the aisle (the cheapest) and one that has two seats on one side of the aisle, one on the other (will cost a little more for that extra room). Upon arrival in Namwon, take a taxi to your hotel, nothing should cost more than 5,000 KRW (about $5). The Suites Hotel – Located a little outside of the city, this is one of the nicest hotels in the area. The site is in Korean; you’ll find booking information here. Information about the hiking trails in Namwon (in English). Gwanghallu Garden – About 2,500 KRW ($2.50) admission fee. More info here. 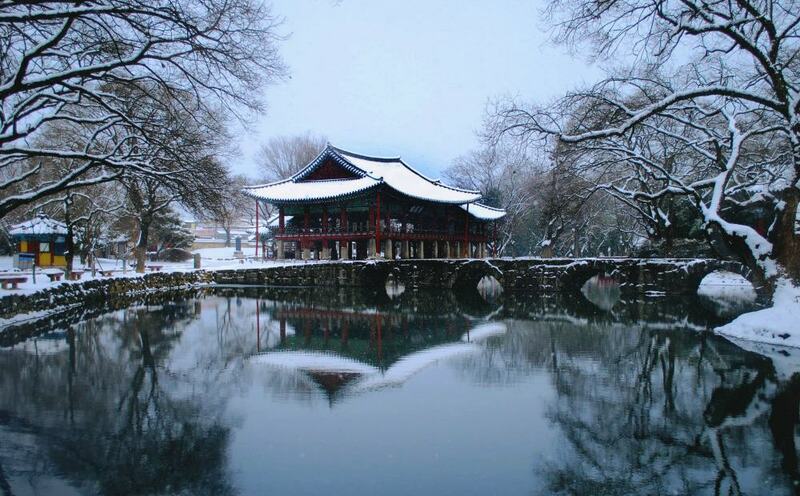 Chunhyang Story – Read about this romantic legend here. Learn about Chunhyang Theme Park here. Samantha is a travel blogger at There She Goes Again and is finishing up her teaching contract in Namwon, South Korea, after which she’ll spend time traveling to Jeju and Seoul for a few weeks before flying home to the U. S. You can follow her on Twitter, Facebook, Pinterest, and Instagram. Thanks for joining us. If you want to make sure you get every episode of the podcast, you can subscribe via iTunes or Google Play. Please come back next week when we’ll be talking about where else to go, whether that’s across town or around the world. Pin this to your favorite Pinterest Board.